1885-86 Towed by E. B. HALE. 1887-88 Towed by CITY OF CLEVELAND. 1887, Dec Rebuilt; new deck. 1888, Apr 26 Tonnage changed 893.66 gross/848.98 net tons. 1889 Towed by MAURICE B. GROVER. 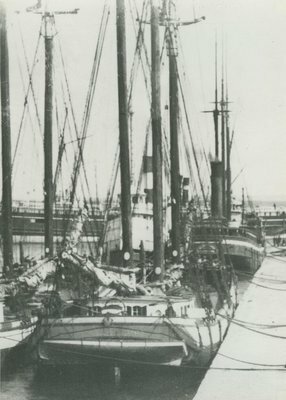 1889, Sep Holed & beached, St. Clair River; repaired, Cleveland, OH. 1890 Towed by HENRY CHISHOLM. 1892-93 Towed by CITY OF CLEVELAND. 1902, Jun 9 Tonnage changed 722 gross/650 net tons. 1910, Sep 18 Burned, Cleveland, OH; abandoned. 1918 Rebuilt as barge; 184 x 32.42 x 11; 610 gross/567 net tons. 1921, Nov 1 Sank, Maumee Bay; raised.